The TextMe Up app allows users to create multiple phone numbers with country codes for the U.S., the U.K., Canada, Germany and France. TextMe Inc. has announced the release of its new TextMe Up app, which allows users to create multiple burnable phone numbers and manage them from a single app. TextMe Up allows users to create as many temporary phone numbers as they’d like, with country codes relating to Canada, the U.S., the U.K., Germany or France. 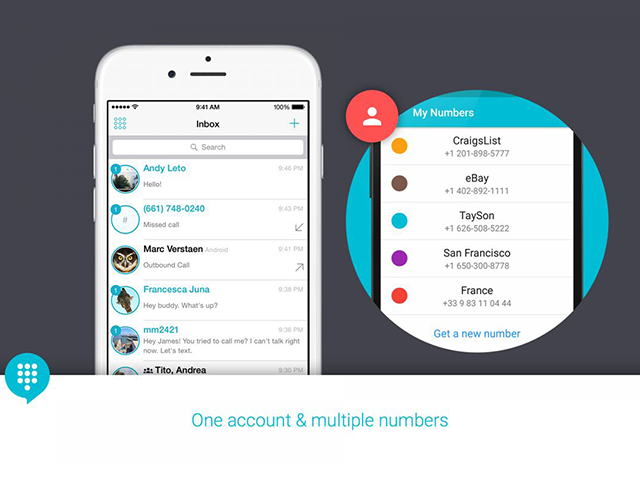 Once users create their first free number for the U.S. or Canada, additional numbers are available for a monthly subscription, with plans starting at $0.99 per month for U.S. and Canadian numbers, and $2.99 per month for numbers for France, Germany and the U.K. Users also have access to a one week free trial for a single number for the U.K., France or Germany. The TextMe Up app allows users to call, text and video chat with users in over 200 countries and territories by either purchasing in-app credits outright, or earning them through voluntary activities, like watching video ads or completing offers. Once users purchase a phone number, they receive 30 bonus credits for free. Finally, a plan offering unlimited calls to numbers in the U.S. and Canada is available for $2.99 USD or $3.49 CAD per month. Before initiating a phone call, users dial their contact’s number, and can preview the cost for texting and calling that number before beginning. If users have created a number for a temporary purpose, they can delete the number when it’s no longer needed. With TextMe Up, our vision of reinventing the phone app is now a reality. Essentially, you’ll be able to use the app the same way you use email. You’ll be able to easily access all of your SMSs, call history and contacts from any device, as well as have multiple phone numbers on the same device. TextMe Up is available to download for free on the iTunes App Store and Google Play.